This is the final review of August, and it is the perfect game for the unofficial end of summer. It is Super Mario Sunshine. I had such great memories playing through this game, but that was a while back. My gaming tolerances have changed since then, but I remember the title being quite remarkable. After playing Super Mario Sunshine over the course of the past week, all I can think to say is "Man, nostalgia is a b*tch!" See why with this retro review. With Labor Day approaching, the unofficial end to summer is closing in. Kids are back in school, the final barbeques are being completed, and the period of time of being able to wear white without some fashionistas scolding you is soon coming to an end. (Who thought of no white after Labor Day anyway?) 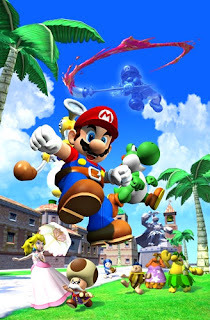 Nonetheless, ten years ago, Super Mario Sunshine left the traditional scope of the Mushroom Kingdom and headed to uncharted territories, a tropical island full of new characters, enemies, and locales. A decade later, and are my memories of the game back in 2002 the same as my thoughts on the game now? Is Mario's vacation fun in the sun, or should he have just stuck to a "staycation?" Every plumber deserves a vacation, and that is exactly what Mario, Peach, Mushroom Kingdom ambassador Toadsworth, and several Toads have decided to do. They land on the cozy shores of Isle Delfino only to find the island completely defaced with hazardous graffiti and "icky, paint-like goop." Little does Mario know that someone is impersonating the portly plumber, vandalizing the island, and framing him in the process. 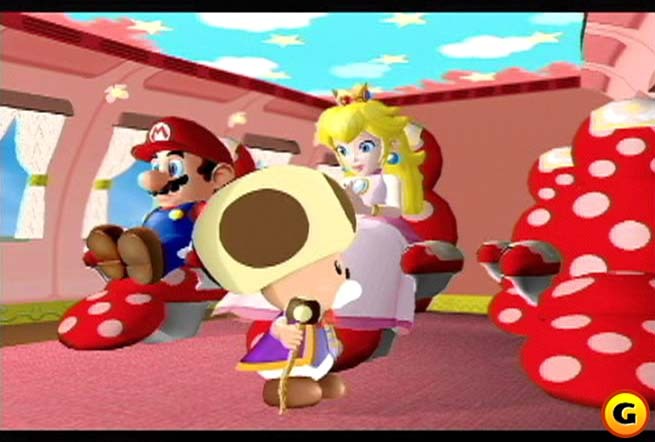 A pair of Delfino Island police officers take Mario into custody. With a swift slam of the gavel, the judge orders Mario to clean up the mess before our hero is able to leave the island. But no worries as Mario is not alone this time around. He teams up with a water-spraying backpack known as F.L.U.D.D. and with the device's help, plans to make Isle Delfino squeaky clean (because clean is better than dirty) and find out the villain behind Mario's framing. 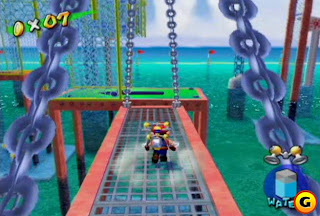 Unlike any other game in the series, Super Mario Sunshine employs complete voice acting for cutscenes. Whether you can appreciate the Saturday morning cartoon vibe displayed is a stance that I think I can say "your mileage may vary." The FMV here is quite charming. 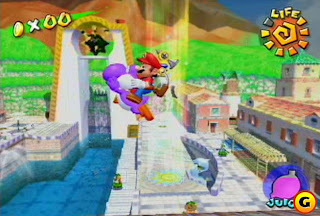 Super Mario Sunshine is more similar in structure to Super Mario 64 than that of Super Mario Galaxy and its same system sequel. The main goal of the game is to complete episodes within each of the Sunshine's levels to obtain Shine Sprites (of which there are the familiar number of 120 total), spirits that will turn the darkened mess of Isle Delfino back into the warm sunny atmosphere the lovely locales are used to. There are also Shine Sprites assembled around Delfino Plaza, the colorful hub of the game, as well as inside secret bonus stages. As Mario collects more and more Shine Sprites, new levels around Delfino Plaza open up for him to explore, containing eight episodes each. of all of these Shine Sprite spirits. There are ten levels that all contain a tropical island theme. There can be arguments made that there isn't that much variety in the locations Mario visits, but really, there are some discrepancies. For instance, there is a ocean-side harbor, a beach, an amusement park, a haunted hotel, a tribal village, a bay with tall cliffs to traverse, and a trek through a blistering hot volcano. The seven main levels are your traditional Super Mario 64-style affairs where you play through eight episodes, all containing their own distinct objectives. One in Ricco Harbor has you ascending a complex vertical series of platforms and walls that can be clung on to and climbed. The Shrine Sprite rests in a cage on the very top of the amalgamation of platforming peril. Meanwhile, one in Sirena Beach has you investigating a haunted hotel where there are multiple hidden passageways leading to otherwise inaccessible rooms. The Shine Sprite hides in plain sight, but it is just a matter of finding a way to get into the room housing it. Other episodes have a more general them such as having you chasing down Shadow Mario, spraying him with FLUDD until he surrenders, or collecting eight red coins spread across a certain portion of a level. challenges for players to get their feet wet to. 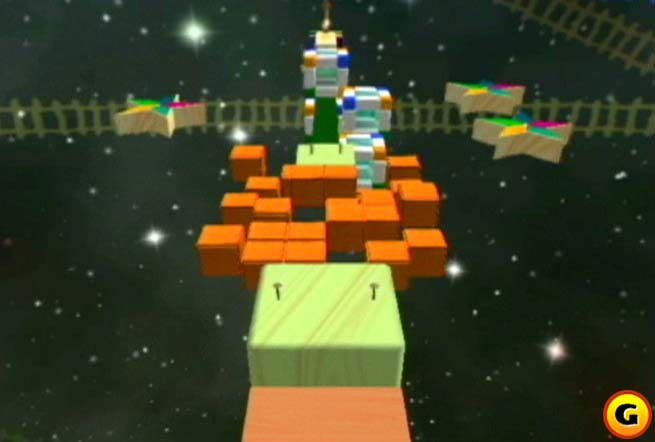 Some episodes hold a mysterious gateway to a special stage that Mario must find. They take Mario within a special bonus area where at the beginning, Mario's doppelganger, Shadow Mario, steals FLUDD from him, forcing him to run and hop through a platforming obstacle course where precision jumping is absolutely key. 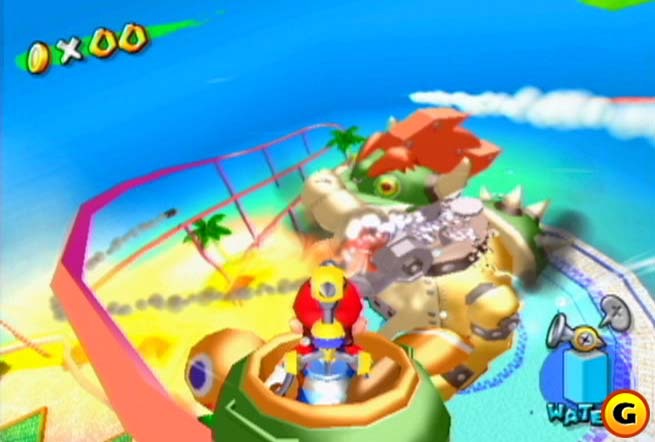 These are some of the most challenging sections of Super Mario Sunshine as Mario doesn't have the capabilities of FLUDD to use as a crutch. There are spinning, flipping, and tilting platforms; cubes that rotate; and sand blocks that will dissolve once Mario steps foot on them. After one of these special stages has been completed, Mario can return to it for a red coin challenge, where FLUDD accompanies him. Gathering all eight red coins strewn about the stage within a strict time limit will give you a precious and well-deserved Shine Sprite. One of several special stages full of skill-based play. There are numerous boss battles to partake in as well with some fierce foes. 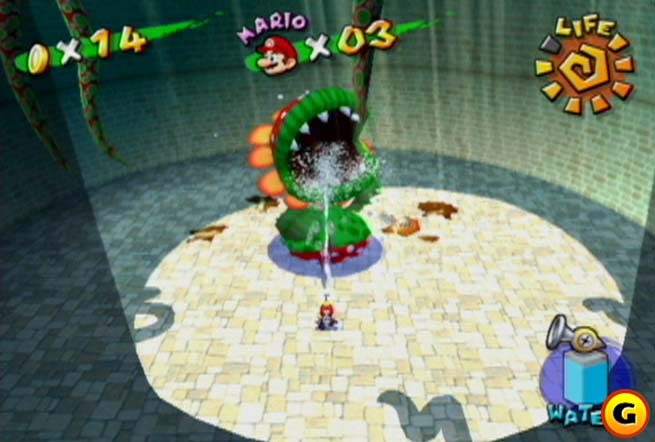 One of the earliest boss battles has you spraying water in Petey Piranha's mouth as the colossal creature foolishly leaves its mouth open. Once it has taken in enough water, its stomach will protrude out and have it topple over, allowing Mario to perform a powerful ground pound. Talk about a gut check. Then there's the encounter with Glooper Blooper in Ricco Harbor. This boss requires you to jump on its tentacles when they swipe at Mario. The leaped on tentacles will become temporarily stuck to the ground, allowing Mario to grab and pull them out. Once all tentacles have been forcibly removed, Mario can run up to the squid's snout and pull like he's never been pulled before. The range of encounters in Sunshine is quite vast, making for some memorable fights (aside from the final boss fight, which is simply disappointing). Sadly, a fair amount of the Shine Sprites found in Super Mario Sunshine are given out through collecting Blue Coins, 240 in all. Every ten Blue Coins can be traded in to a Tanooki in Delfino Plaza for a Shine Sprite. Some of these coins are placed in easy spots, but a lot of them are in hard-to-find locations, requiring extensive searching and trial-and-error. They just feel like blatant and unnecessary padding to make the game last longer than it needs to be. Mario by his lonesome has a plethora of moves in his acrobatic arsenal. For a pudgy plumber, this guy can move. He can dive, covering loads of ground in seconds. He can jump between two walls to reach higher destinations. He can back flip to gain greater height. He can ground pound, and do much more. Cataquacks, the camera is also your enemy. But like I said earlier, this time he's not alone (well, besides during the special stages). Mario has FLUDD around on his back. This verbal robotic device in normal mode can spray graffiti off walls and floors. It can daze certain enemies with a simple spray of water. There are also various Nozzles that can be equipped. (However, Mario can only have one special nozzle equipped at a time.) The Hover Nozzle is great for crossing large chasms that Mario otherwise wouldn't be able to jump over by his lonesome. The Rocket Nozzle allows Mario to be propelled high into the air to reach towering heights, while the Turbo Nozzle sends Mario careening at a grand speed across both land and water. 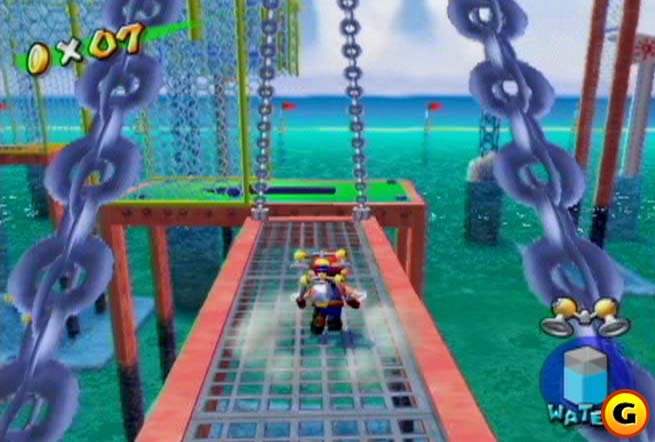 However, FLUDD doesn't have an infinite amount of water it can hold. 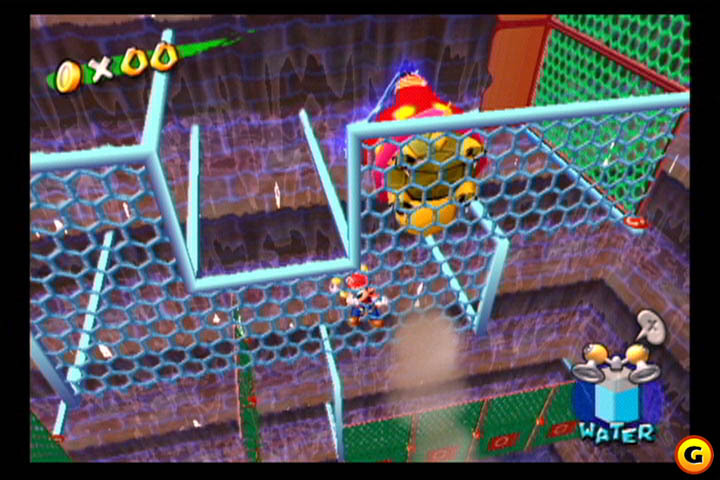 When it gets low, Mario can enter a body of water and refill FLUDD's tank. The addition of FLUDD opens up tremendous possibilities in the platforming and how the levels and the episodes are completed. 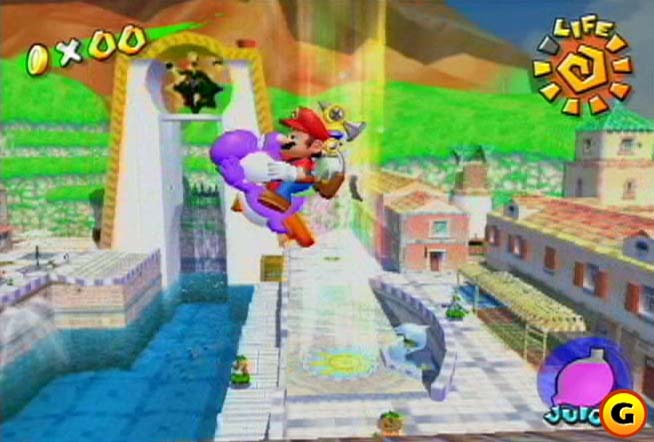 Mario can perform some serious acrobatic athletics with FLUDD that would be impossible without the device. In addition to FLUDD, Mario can occasionally come across a Yoshi egg. By feeding the egg its desired fruit, a Yoshi will hatch from its imprisonment. Mario can ride the darling dinosaur, spraying juice at foes (some obstructions can only be cleared with Yoshi's spray), and other helpful feats. Unlike other games in the series, however, Yoshi will disappear immediately if it enters a deep body of water or runs out of juice. For the first time in 3D, Yoshi is here! Regardless, Mario games generally feel tight and responsive in their controls. For some reason, Super Mario Sunshine doesn't fully have that sentence going for it at all times. I often felt myself not fully being in control of Mario. This is especially apparent with the abhorrent camera. It constantly gets caught behind walls and objects, and this is nowhere as obvious to see than a particular episode in the Pinna Park level. 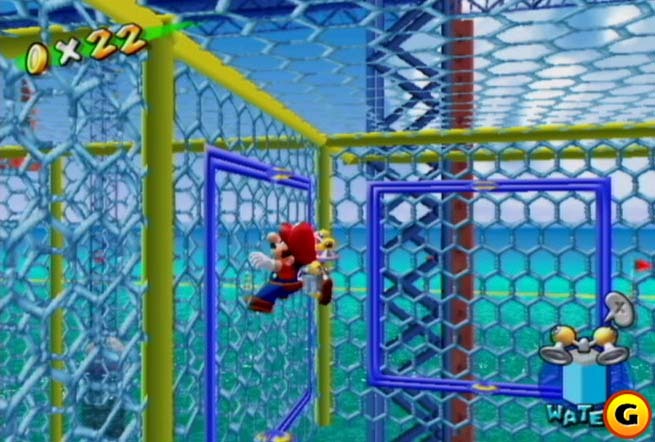 Mario has to climb up the backside of the amusement park's ferris wheel. Unfortunately the tight confines make the camera act out like me on a bender. It is also problematic when you use the Rocket Nozzle, and it the camera jerks to a view below Mario. That's good and all, but it doesn't shift back to show where Mario is about to fall, making for frustrating guesswork and trial-and-error (there's that term again). I can understand why Nintendo went with a new camera system for the Super Mario Galaxy games. with the game's troublesome camera. The main drawback with Super Mario Sunshine is that there is no feeling of complete control, and that isn't a statement I thought I'd say for a Mario game. The Hover Nozzle, something that you'd think would fully feel fine isn't perfect either. Sometimes Mario's momentum in midair just stops as he hovers, particularly when close to a ceiling. It's just aggravating. And don't even get me started on controlling Mario in a boat. There just seems to be a total lack of polish. Mario sometimes controls clumsily, the camera acts just as bad, and there are glitches like Mario not grabbing onto ledges or falling through platforms. Was this game rushed or what? Super Mario Sunshine is a bounty of color. The worlds are vibrant, lush, and full of interesting details. The game tends to run at a steady framerate, but there are indeed moments where the game appears to be pushed to its limits and everything slows down to a tremendous chug. As for the sound, the voice acting is either take it or leave it. It is quite polarizing. Some will like it, some will hate it. I don't think there is much middle ground to be had for most people. On the side of the music, the genius composers at Nintendo once again provide some very catchy melodies like Delfino Square, Bianco Hills, Noki Bay, the a capella Super Mario Bros. theme in special stages, and the main boss theme. Overall, the presentation package of Sunshine pleases. Make a mecha mess out of Mecha Bowser. 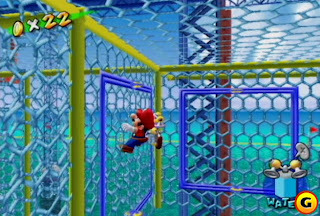 No Mario game has ever tested my patience as much as Super Mario Sunshine. I don't recall the game being of this lesser quality than other games in the much heralded series, but then again, it's been a long while since I've played the game since my fond times with it. 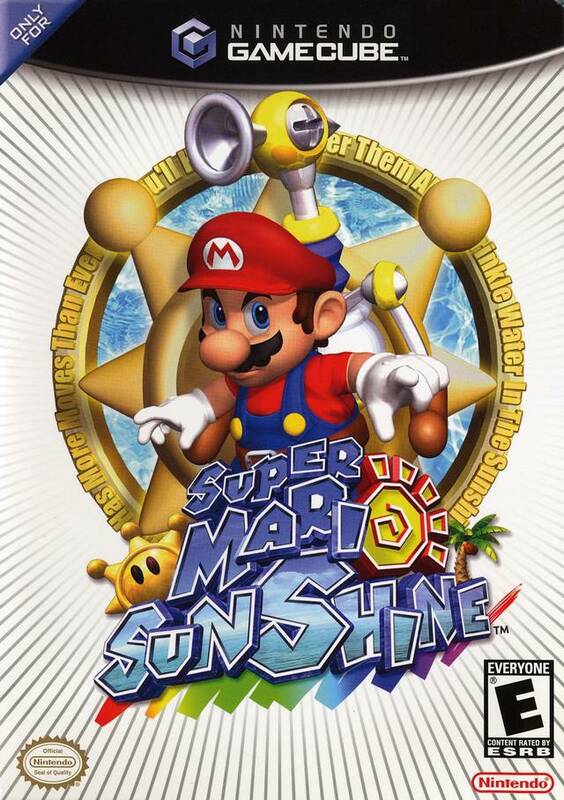 From the severe lack of polish, large amount of glitches, the feeling of never being in total control of Mario (a first for me for the 25+ year-old franchise), and the atrocious camera - one of the worst I've seen from a Nintendo EAD game, Super Mario Sunshine has a lot of problems that detract from the experience. It has a lot of fun moments and awesome ideas, but for every two terrific moments, there seems to be one moment that is truly and simply awful. 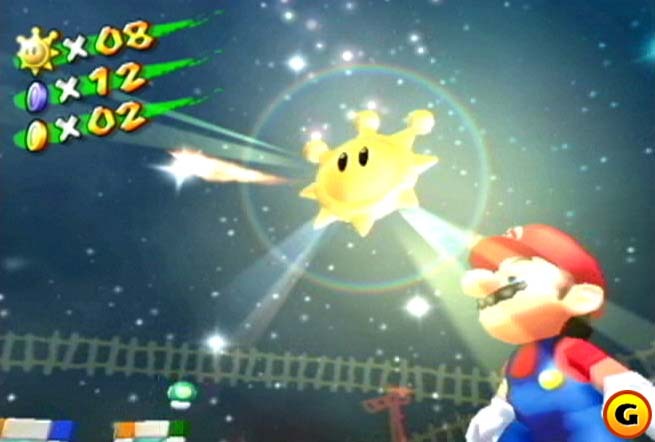 FLUDD is an outstanding addition to the game, and it makes Super Mario Sunshine stand out, even when the execution is imperfect. I have no qualms with stating that Super Mario Sunshine is without a doubt the worst 3D Mario game I have ever encountered. It's a shame, too, because my memories of the game when I first played it were so vivid and positive. As it is, Super Mario Sunshine is a game that will sometimes delight like a warm summer's day, while other times it is a game that is as painful to play as a sunburn.